More skate, less hate… From Press Release. YouthNoise and Nike have come together to create Play City, a youth-led movement that uses sport as a catalyst for personal and social change. We envision a world in which every village, town and metropolis is part of our global Play City and every individual has the opportunity to play. Our goal is to build a community of millions of young people to inspire and activate their peers to play and address the most pressing issues in their communities by using sports. This summer, YouthNoise is partnering with the Skate Park Association to host the ultimate skate competition for all ages at the Salvation Army in South Los Angeles. The Less Hate, More Skate event will combine skateboarding with social justice to repeal the No Skate laws in SoCal. Participants will enjoy snacks, a live DJ, skate contests, prizes and art, and will take action by painting a banner and signing a petition to decriminalize skateboarding in many public spaces. The Salvation Army will also be showcasing their full programming for youth of all ages and will be selling memberships for teens at half-price for the day of the event ($7.50 for six months)! The Less Hate, More Skate event will bring youth activists, adult allies and community groups together to break down stereotypes about skateboarders and to advocate for skateboarding as a fun and healthy activity. 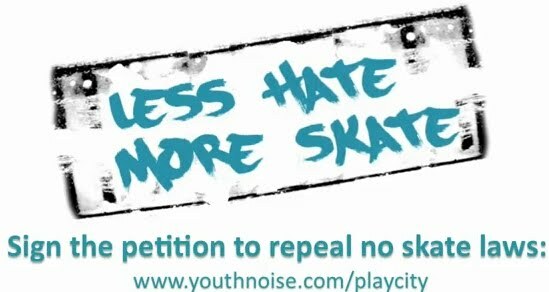 Less Hate, More Skate is a YouthNoise campaign that seeks to raise awareness and prompt community action to address laws targeting skaters in Southern California. YouthNoise believes that skateboarding gives youth an opportunity to build skills, socialize, spend time outdoors, and utilize an alternative form of affordable transportation. Anti-skateboarding laws make it difficult for boarders living in the heart of the city to practice their skills. "When we say skateboarding is a creative expression and healthy activity that keeps people away from deviant activities in the big urban jungle, the state and subsequent counties all over LA say (in legally binding terms) that it's a menace to society," says Oakley Anderson-Moore, a local Play City blogger and skateboarding advocate. "By making skateboarding illegal in many public spaces, Los Angeles not only promotes a culture of distrust of skateboarders, but also discourages youth from becoming involved in a productive and healthy pursuit," says Anne-Marie Herwig, campaign organizer for Less Hate, More Skate. Chris Gutierrez from Venice, California, agrees, "Before, I was into hanging out in the streets with my homies, doing dumb stuff. Skateboarding was a way out. It is a blessing to have it in my life and changed me a lot from what I used to be." Participants will have an opportunity to sign the Less Hate, More Skate petition, to be presented to Mayor Antonio Villaraigosa.